Fluid processors in need of reliable non-clog pumps to replace the broken or worn-out Super T Series pump equipment currently in use at their fluid processing operations in the US and Caribbean islands are always excited to learn about the cost-effective pump solutions from Phantom Pumps. We’re the centrifugal pump manufacturer with multiple pump lines, including Low Pressure, High Pressure, DPump and Slurry Pump Lines, filled with exceptional non-clog pumps that meet and exceed the highest industry standards. Phantom Pumps high pressure PH-Series and XU Series non-clog pumps feature impellers ranging from 11” to 12-1/2” and offer solids handling from 1-1/4” to 1-3/16”. Our field tested and patented slurry pumps achieve up to 700% longer wear life and efficiency gains of up to 7% over other leading brands. We design and manufacturer all of our Phantom Pumps pump equipment as compatible and interchangeable replacements for higher cost pumps produced by Gorman-Rupp, Warman, ESCO Pumps and other well-known manufacturers. 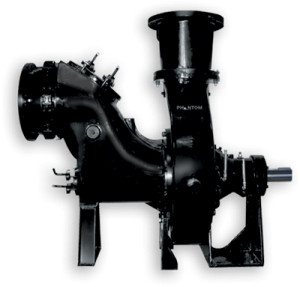 Organizations in Florida, Alabama, Georgia, Ohio and the Caribbean find pump related costs are usually reduced when they substitute our PL-Series and PH-Series pumps for Gorman-Rupp U Series, T Series and Super T Series pump models, LP and HP Series ESCO Pumps models, S and I Series All Prime models, or AH Series Warman models. Our pump specialists and application engineers are available to cross-reference existing equipment that is currently in use with the models in our line that match your facilities’ processing requirements and specifications. To request quotes on any of our highly sought after pump equipment or learn more about our exceptional quality non-clog pumps, contact one of our courteous and knowledgeable Phantom Pumps associates today. We look forward to serving you and your fluid processing facility!